Microgrant applications are now closed! The microgrant applications are now closed. Thank you all who submitted your ideas! The applicants will be notified of results soon. Please consult our FAQ page for most commonly asked questions about the grant process. REDDING WINS CALIFORNIA CULTURAL DISTRICT DESIGNATION! The California Arts Council just made a BIG announcement for our little district: Redding Cultural District has been chosen as one of the first to receive the state’s California Cultural District designation! The program was developed to celebrate the diversity of our state, while unifying under an umbrella of shared values-helping to grow and sustain authentic grassroots arts and cultural opportunities, increasing the visibility of local artists and community participation in local arts and culture, and promoting socio-economic and ethnic diversity. We’re excited to share our district‘s culture and creativity, and proud to be a part of California’s cultural synergy! Check out our district‘s feature page and the rest joining us in the pilot program at www.caculturaldistricts.org. According to Caitlin Fitzwater, director of public affairs & interim program coordinator of the California Cultural Districts program, “It was a six-month long process that included 43 original applicants with 22 semi-finalists and 14 actual designated districts. The California Arts Council was tasked with setting up, reviewing and choosing the cultural districts. “It was a very competitive pool of applicants,” Fitzwater said, adding the next applicant period will be in 2019. Each applicant will receive $5,000 annually to participate in the pilot two-year program although the designation lasts for five years. The 14 districts recommended for state designation represent a broad diversity of California – geographically, culturally, and artistically – as set forth by the program goals and values. According to Lucero, SCAC is the lead agency in a six-partner team which includes VIVA Downtown, the City of Redding, Turtle Bay Exploration Park, Shasta Historic Society, and The McConnell Foundation. She said, however, many individuals and organizations contributed to the initial letter of interest – ranging from citizens to nonprofit organizations to business entities. The first phase involved letters of participation, an overall historic, cultural and developmental assessment in the form of a 10-page letter of interest and supporting documents. The next step in the application phase was the site visit on June 1 and finally, there was a final submission of map, fact sheet and brief district description. While Lucero said there is no cost to the program and currently no funding in place by the state, the designation will assist Redding in branding its assets and putting it on the cultural map of California. “Tourism is an economic driver in our town and this designation will highlight Redding Cultural District in ways we currently can’t possibly fund on our own. Simply having a major presence on the VisitCalifornia.com website will be a plus,” Lucero said. Redding has several well-developed, world-class segments of the district and connecting trails (existing and being built) but is in need of a stakeholder-branding-marketing and re-development movement to connect our world-class assets at the river to the downtown core where historical and cultural assets exist. The McConnell Foundation, largely responsible for the construction of the world-famous Sundial Bridge and Turtle Bay Exploration Park, has turned its attention to Redding’s Downtown. We believe a California Cultural District designation, along with Redding’s new Downtown Specific Plan and recently adopted Downtown Transportation Plan will spur the necessary interest and investment among stakeholders, elected officials, government, business, and nonprofits. The designation will enable us to connect our arts, culture and historical assets under one umbrella to create a sustainable cultural district – one that encompasses the bend of the Sacramento River to Downtown Redding in a cohesive manner. 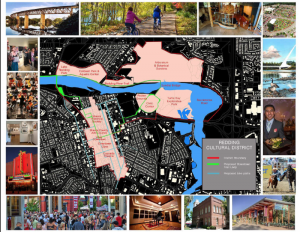 Our timing to create a Redding Cultural District could not be better and a state designation would carry the necessary weight to attract a variety of partners. Shasta County Arts Council– an Arts & Culture Agency and Lead Partner – located in the district. Shasta County Arts Council (SCAC) is a 36-year State/Local Partner to the California Arts Council. Our mission is to: Invigorate the Arts through Education, Support and Practice. Our activities are varied and cross many disciplines – from dance, music, theatre and live performance to film, literature, multimedia, and 2- and 3-dimensional visual arts. We serve as an incubator to projects that cross these disciplines and are a primary low-cost venue for recitals, lectures, movies, live performance, theater, classical music, classes and digital media arts activities. We are also very active with local high schools and middle schools in the visual arts category. VIVA Downtown– a Main Street Organization – located in the district. Viva is a nonprofit organization dedicated to enhancing the cultural, social and economic development of Downtown Redding, California. Viva Downtown is an officially recognized National Main Street Organization and a member of the California Main Street Alliance. The Main Street Model relies on personal, group, business, and local government participation. Viva follows the recognized Main Street Four-Point Approach and has standing Design, Economic Vitality, Promotion and Organization Committees.Viva’s volunteer Board has successfully advocated for civic improvements over the past 20 years. Viva hosts popular public events encourages Downtown Redding as a consumer destination and provides information to the general public. Viva is a founding member of the Downtown Collaborative. In 2015 and 2016, Viva worked closely with the City of Redding to develop and complete a Downtown Transportation Plan and to make major updates to the City of Redding Downtown Specific Plan. City of Redding – Government Partner – not in the district. A comprehensive parking and transportation study was completed in 2016 and a complete revision of the Downtown Specific Plan is being conducted now by Placeworks, a Berkeley-based company that assists with jurisdictional planning. These two large-scale planning projects are setting the stage for a successful cultural district in Redding. The City is actively engaged in road dieting to promote pedestrian and bicycle right of ways; and involved in projects that promote live/work space in Downtown like the K2 Project which just received a $20 million state grant to create live/work space and affordable apartments and market condominiums in Downtown. The McConnell Foundation– Private Independent Foundation – not in the district. Formed in 1964 by Carl and Leah McConnell to share the benefits of their lifelong accomplishments. The Foundation began actively giving grants in 1988. Prior to 1988 the McConnell’s regularly gifted small amounts of their personal money to such groups as the Guide Dogs for the Blind and the YMCA. 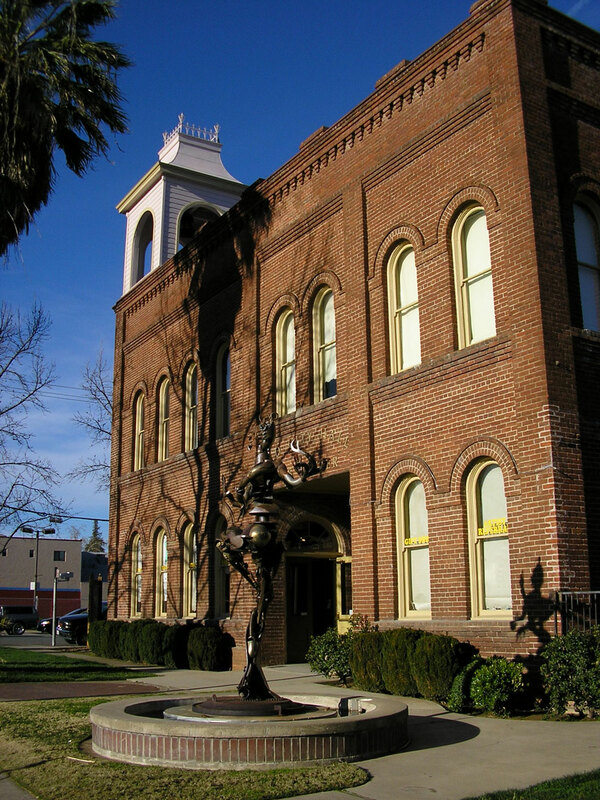 Shasta Historical Society – a Historical/Heritage organization, located in the district. The Shasta Historical Society encourages and inspires the exploration of Shasta County history through programs, publications, collections, and research services. As an educational and research institution, the Shasta Historical Society communicates and preserves our shared local history. In an effort to help revitalize downtown, the Society has made the downtown area and the preservation and integration of historic structures a focus, initiating a project to thoroughly survey the downtown area and record information about the historic structures and structural elements. Few buildings from the significant periods of development in Redding’s history remain. The loss of these physical buildings has resulted in a loss of historic context in Redding. The Society’s work to identify and contextualize the buildings and elements in the downtown aligns well with a formal cultural district and the Society will be able to continue to promote the value of the history of the region and continue our work to become a hub for Northern California historical organizations. Turtle Bay Exploration Park –a fun, non-profit 300-acre gathering place featuring the Sundial Bridge, a museum, forestry & wildlife center, arboretum and botanical gardens, located in the district. At the gateway to the Sacramento River Trails, Turtle Bay celebrates far Northern California as part of the world we share. With a mission to inspire wonder, exploration, and appreciation, we envision Turtle Bay Exploration Park as a vibrant gathering place where our community is strengthened through education, cultural engagement and economic growth. The Redding community is working to put the city on California’s cultural map, in hopes that branding it as a “cultural district” could help attract tourism and boost economic development. The concept was introduced last year by the California Arts Council, which aims to establish “cultural districts” across the state. These are areas that have a well-defined geographic area and a concentration of cultural resources and activities. Thursday evening, two representatives from the California Arts Council, Jason Jong and Josy Miller, were at Old City Hall, where they talked with local government officials, business owners and artists, about why designating Redding as a “cultural district” held importance. Redding and Weaverville are both semifinalists of 22 other locations. renovated, a number of restaurants, popped up around it, further boosting the city’s development. “You can help us build on that and make this a more glorious place,” she said to Jong and Miller. The Redding Cultural District map entails portions of downtown Redding’s attractions like the Shasta Historical Society and Cascade Theatre, and ties it into the Sacramento River Trail connecting to Turtle Bay Exploration Park, Sundial Bridge, the Arboretum & Botanical Gardens, and Lake Redding Park. In the works are perspective bike pathways. Miller asked the crowd why Redding specifically should be granted a designation. community education specialist at the Shasta County Health and Human Services Agency. Dadigan spoke about an open mic night that the Shasta County Health and Human Services Agency and Shasta County Arts Council conduct, which gives people a platform to express themselves through music and poetry and raise awareness about mental health struggles, substance abuse disorders, and suicide. “It’s a lot easier for people to express what’s going on in their life with the arts,” he said. “It’s going to give us a voice in Redding. We want people to come here,” Lucero said. The Shasta County Arts Council has partnered with VIVA Downtown, the City of Redding, Turtle Bay Exploration Park, Shasta Historical Society and The McConnell Foundation. Read full article on Record Searchlight here! REDDING – Redding Cultural District has been selected as a semi-finalist for the California Cultural Districts program. The California Arts Council, tasked with setting up, reviewing and choosing the cultural districts, convened a panel last week in Sacramento to assess all submissions to the program. “We are very excited to advance to the next phase of the process,” Debra Lucero, Executive Director of Shasta County Arts Council (SCAC), said. According to Lucero, SCAC is the lead agency in a six-partner team which includes VIVA Downtown, the City of Redding, Turtle Bay Exploration Park,Shasta Historic Society, and The McConnell Foundation. She said, however, many individuals and organizations contributed to the initial letter of interest – ranging from citizens to nonprofit organizations to business entities. The first phase involved letters of participation, an overall historic, cultural and developmental assessment in the form of a 10-page letter of interest and supporting documents. Fitzwater said the next step in the application phase is the site visit. Redding Cultural District’s assigned site visit date is June 1. Site visits will be scheduled for an approximate 3-4 hour window and will be conducted by California Arts Council staff. All site visits will have two components: 1) Tour of the district 2) Stakeholder meeting. “We look forward to completing the application by June 23,” Lucero said. Click the button below to learn more about Redding Cultural District!